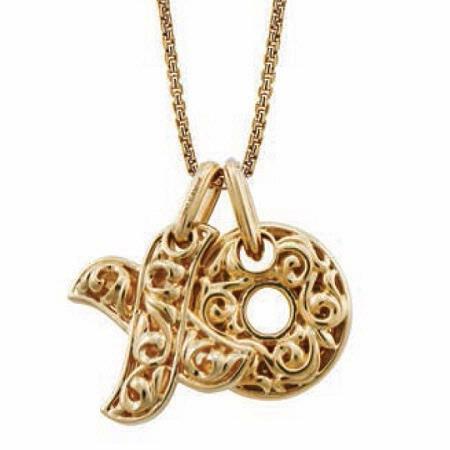 Charles Krypell Large 18k Yellow Gold Hugs and Kisses Necklace This is an incredible Charles Krypell large 18k yellow gold necklace with "Hugs & Kisses" engraved on the back measuring 19mm. Pendant Details:Pendant measures 19mm in length with "Hugs & Kisses" engraved on the back. This is an incredible Charles Krypell large 18k yellow gold necklace with "Hugs & Kisses" engraved on the back measuring 19mm. This necklace is approximately 32 inches in length. The pendant measures 19mm in length with "Hugs & Kisses" engraved on the back. We are an authorized Charles Krypell dealer. Please call for pricing 1-800-790-6980 or 1-212-302-2863.